You all are probably wondering what could possibly be my skin concern for this month? Well, I would like to see more even skin tone, reduced expression lines around the eyes and forehead, and smoother texture of my skin. How about you? Do you have things that you would like to improve with your skin? Share and make a beauty pledge to yourself too. What are you doing to use to improve your key concerns? Well for me, I will be using the following key items. A non-drying, foaming cleanser that washes away surface oil and makeup. Refreshes as it cleanses by removing surface impurities and makeup. Leaves skin soft and smooth. Hawaiian White Ginger Extract: Hydrates skin. -Algae Extract: Diffuses oil and improves skin smoothness and elasticity. -Cucumber Extract: Soothes as it refreshes. What I like about this cleanser is that it removes makeup well, and it works wonderfully with my Clarisonic Skincare Brush . My skin is left with a wonderful invigorating feeling of being clean without over drying my skin. A rich, silky serum that restores a youthful, healthy glow to the skin. 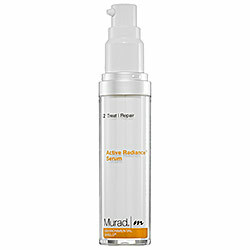 Murad Active Radiance™ Serum Featuring Resilient-C™ Complex encourages collagen production to help skin resist environmental stress and damage. Its advanced formula boosts cell proliferation to reverse visible signs of aging. This formula has been clinically demonstrated to brighten and renew skin in one week by improving natural radiance and clarity, smoothing skin, and restoring youthful texture and tone. -Resilient-C™ Complex: Delivers highly stable Vitamin C—50 times the potency of prior generations—to improve skin radiance, help enhance collagen production, and protect against free-radical damage. -Ectoin: Unleashes the cellular defense system, helping cells resist drastic environmental stresses including UV exposure and chemical aggressors. -AHA and Myrtle Extract: Provide rejuvenating properties that encourage new cell growth and help boost cellular vitality. What I like about this serum is that just after a few days of using this my skin feel smoother and appears to be more radiant during the day time. The serum absorbs fairly quick, so that your skin in not left with a sticky feeling. A powerful nighttime antiaging treatment. 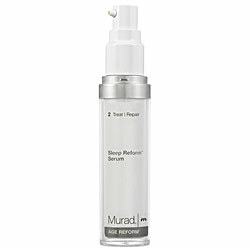 Murad Sleep Reform™ Serum takes “beauty sleep” to a new level—locking in moisture, promoting skin firmness, and fighting signs of aging so you wake up to a radically rejuvenated complexion. Murad’s exclusive Repair Enhancing Matrix (REM) is designed to maximize the effectiveness of the skin’s nightly repair cycle, promoting cellular turnover and renewal. This serum’s unique topical melatonin delivery system promotes collagen production, softening the appearance of fine lines and wrinkles. Get ready to say “good morning, gorgeous!” in the mirror in the morning. Sleep Reform™ Serum has been shown to stimulate the proliferation of the cells responsible for collagen production by 78%, improving collagen production potential by 62%. With using this serum for night time use I am noticing that when I wake up in the morning my expression lines appear more relaxed and not too puffy looking. You know how sometimes when you wake up your crows feet and forehead lines looks for exaggerated for sleeping? I guess I look more rested and wrinkles where smoother!! An eye cream with antiaging and firming action for mature skin types. Korres Olive & Rye Eye Cream contains a high percentage of vegetable oil (53%) and uses a special technique to ensure the gradual release of its active ingredients. It also provides nourishment for the skin that lasts throughout the entire night. What I like about this eye cream is that my skin feel extremely hydrated, however I am not too sure if I see firming. Although, it has only been a few days since I started to use this one consistently, so stay tuned. A powerful, antioxidant-rich sunscreen that shields and restores environmentally stressed skin. Block UVA and UVB while preventing free-radical damage with this complexion-protecting essential. The advanced formula multitasks, improving the skin’s barrier function to maintain optimal hydration. I like the fact that my skin is protect for the UVA and UVB rays and it definitely does moisturize, but I am on the fence when it comes to the texture. It feels kind of sticky or thick due to the sun screen that is in it, but overall it is not bad. An intensive hydrating, rejuvenating, and restorative night cream. Promotes healthy cell turnover and nourishes and rejuvenates skin overnight by restoring lost moisture. So far I love this night time moisturizer. It is light weight and fluid and my skin just drinks it! I wake up in the morning and my skin feels so soft. Definitely would recommend this one for sure! All in all, I am going to make a commitment to my skin and stay consistent with this regimen and I will follow back up with you all in 5 weeks to let you know the details and show before and after photos of my skin. Are you up for the same challenge? Share what are you going to do in order to improve your skin and have it in the best condition possible for summer 2010? I would love to know what you will use whether if it is drugstore brands or department store brands definitely share. Until next day stay fab and fierce inside and out! !